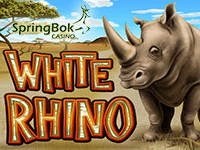 Springbok Casino is launching a freeroll tournament on White Rhino slot which will be available throughout March. Being very popular among the players, the game inspired by an endangered species roaming free in Kilimanjaro in Africa, is available in the downloadable casino. The huge R25,000 prize is on the line and the good news is that taking part in it doesn't cost you anything. All you have to do is to claim your 2,500 chips or claim extra 3,500 credits at the cost of just R50 if you want to boost your chances of winning. The slot released by Realtime Gaming is a wild adventure on five reels themed on safari and your assignment is to seek the elusive rhino allegedly seen only by few people. Packed with special features such as free spins and multipliers, the game is played at 25 variable paylines. The slot delivers the 30,000 coin top jackpot and a major and a minor progressive jackpot. The progressive jackpots are awarded randomly and can be won at the conclusion of any game. The reels are populated by various wild animals like an antelope, ostrich, elephant and a gorilla standing for low paying symbols, while the highest payouts are delivered by a safari jeep and an explorer. White Rhino, the most wanted animal, represents Wild and comes in handy when completing winning combinations. Wilds can appear in stacks and if you catch a herd of rhinos on the reels, a large reward awaits you. The game contains two more symbols you'll love to see on the reels - Kilimanjaro and a safari guide, both representing Scatters. Hitting two or more Kilimanjaro symbols left to right trigger the feature during which the existing combination of Scatters is held while the other symbols respin three times preserving Scatters that deliver payouts in the bonus game. Three or more the safari guide symbols pay anywhere on the reels delivering 10 free spins. The feature can be retriggered and all the combinations including White Rhino Wild are tripled.